Editor's Pick at Naturescapes.net for "Medicine"
I'm happy to announce that one of my favorite images from the autumn season has received the prestigious Editor's Pick award over at Naturescapes.net. I titled this one "Medicine" as I processed it during some ho-hum winter weather, and it was just the kind of Medicine that I needed at the time. I can still remember myself standing in the cool waters on a mild autumn day deep in the mountains of Tennessee. And what a fond memory it is! 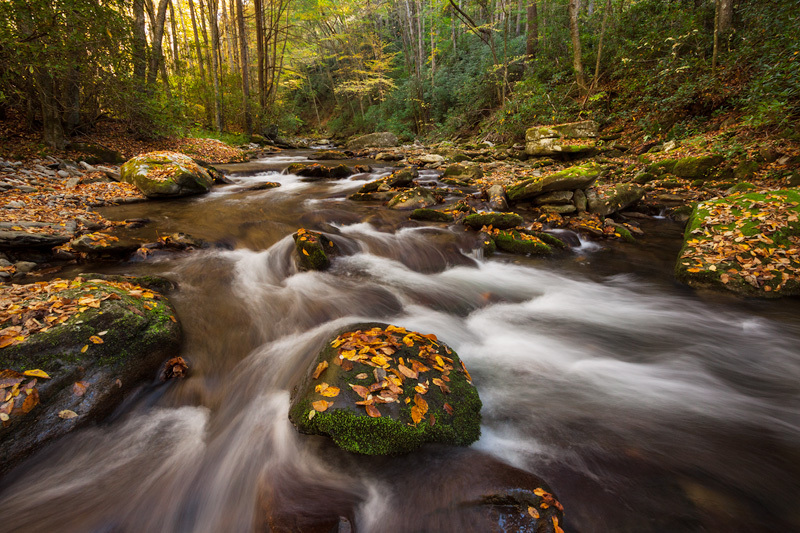 This photograph was taken in the morning along Straight Fork in Great Smoky Mountains National Park. The color in the Smokies was quite lackluster (to put it lightly) during the past fall season, but there was still pockets of beautiful color to be found here and there. In this particular location, the lush rhododendrons along the banks helped to kick it up a notch. One of the main issues during this photo excursion was the abundance of high pressure days. During these times of high pressure, not a cloud was seen for days on end. Literally! By arriving at the stream early before direct sunlight filtered in, I managed to capture an image that had beautiful light that was soft, subtle, and directional. On a cloudy day, I would be happy with this image, but it would lack some of the "pop" and complexity that it currently has. The moral of the story: don't give up shooting certain subjects such as streams on sunny days ... just get out there a bit earlier (or later, in the afternoon)! Techs: Canon 50D, Canon 10-22 @ 10mm, Polarizer, ISO 400, f/13, 0.8 seconds, Gitzo 1325 Tripod. Blend of two images, one exposure for the sunlit upper left, and one for the rest. Editor's Pick at Naturescapes.Net for "Hope Remains"
What a great couple of weeks! I've been out shooting often in this lovely summer weather, and have been quite happy with the results. I am honored to announce that another one of my new images, "Hope Remains" has won Editor's Pick over at Naturescapes.Net. Cool! The image is of an adult Great Blue Heron fishing in the immense rapids of Great Falls National Park, Virginia. This area is close to my home, and one of my favorite locations to photograph at. There is definitely something to be said to visiting a location over and over again in order to learn every little detail about it. Thanks to my familiarity, I knew that there was a Great Blue Heron rookery up the river from the falls, and that both adults and youngsters would be fishing in large numbers during a 1.5 month span in the middle of summer. Making multiple trips to Great Falls during that time allowed me to find these herons in some really interesting locations. Using my 70-200 f/4 lens, I chose to shoot this image rather wide and at a relatively slow shutter speed to incorporate the beautiful flowing water around the heron. "Hope Remains" - Great Blue Heron fishing in Great Falls National Park, Virginia, United States. Technical Spectacles: Canon 50D, Canon 70-200 f/4 @ 145mm, ISO 200, f/11, 2 seconds. Gitzo 1325 tripod. Editor's Pick at Naturescapes.Net for "Summer's Flow"
Just wanted to post a quick message to alert readers to my most recent accomplishment. My image, "Summer's Flow" has received the prestigious Editor's Pick award within the Landscape Gallery at Naturescapes.net. If you haven't checked out Naturescapes.net, I urge you to do so. The forums contained on this website are alive and vibrant with many helpful and skilled photographers. It is truly a helpful community to be a part of. For those of you that haven't seen it, here is the winning image. "Summer's Flow" - Summertime Waterfall in Rickett's Glen State Park, Pennsylvania, United States. Technical Spectacles: Canon 50D, Canon 10-22 @ 12mm, ISO 200, 8 seconds @ f/11. Gitzo Tripod. Polarizer. In about an hour I'll be starting the long drive to upstate New York for a little 1 week vacation. It's mostly going to consist of relaxing and hanging out with family and friends, but hopefully I'll get some photo ops mixed in. We'll find out! Until then, have a good one week! Hi everybody, Sorry for the lack of content lately. I went to the highlands of West Virginia last week to photograph fall color and had a very successful trip. The color was amazing! Unfortunately, upon returning home, my accurate color-calibrated monitor faded to black and never turned on again. I'm now using a really bad monitor pulled up from the depths of my basement closet. To say that I can't accurately process images due to the monitor having horrible contrast and color is an understatement. Because of all of this, I will likely be taking a little break on the blog until I can acquire a new monitor to process my new images. Thanks for the understanding ... and know that I can't wait to get back on here posting new images. Hopefully it won't be too long! 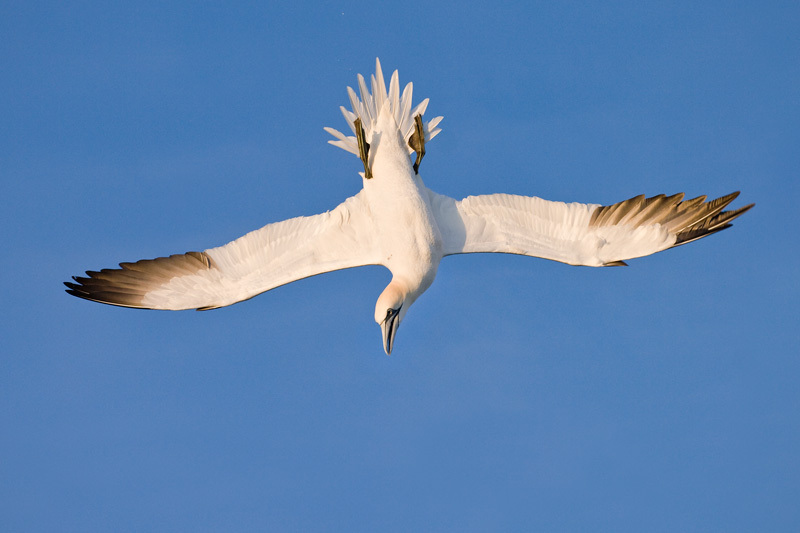 Northern Gannet Diving in Flight, Delaware Bay, Delaware/New Jersey, United States. Northern Gannet Banking in Flight, Delaware Bay, Delaware / New Jersey, United States.